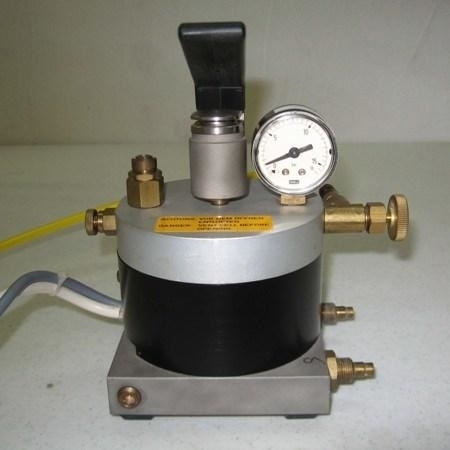 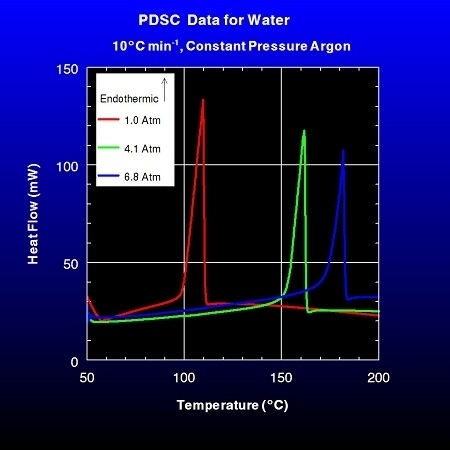 The PDSC is similar to conventional DSC except the sample is run under an applied pressure within the range from ambient to 15 atm. 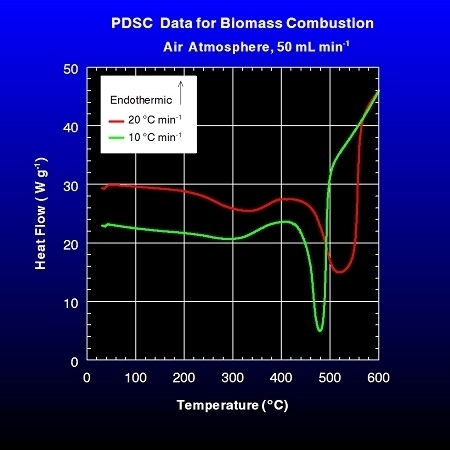 PDSC is useful for examining the influence of pressure upon the kinetics of heterogeneous reactions such as the combustion of biomass. 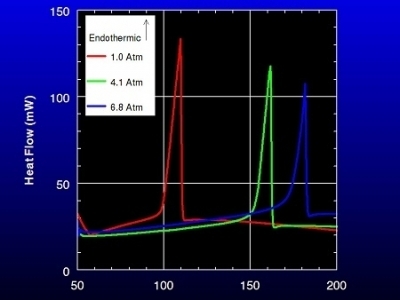 Thermal curves show the variation of the peak temperatures for boiling point of water as a function of applied pressure. 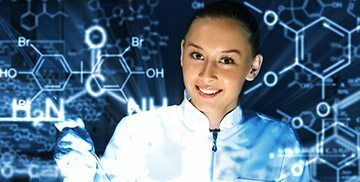 The pressure dependence of the phase transformation may be used to determine the associated enthalpy change. 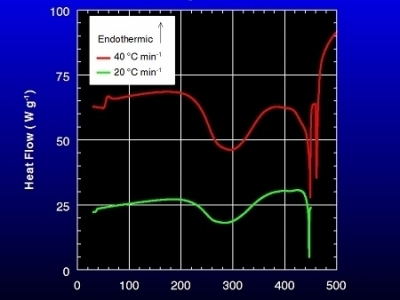 Graphic illustrates the variation of peak temperature with heating rate for biomass combustion under an air atmosphere. These data are useful for evaluation of thermokinetic parameters such as the pre-exponential factor and activation energy for the combustion reaction. 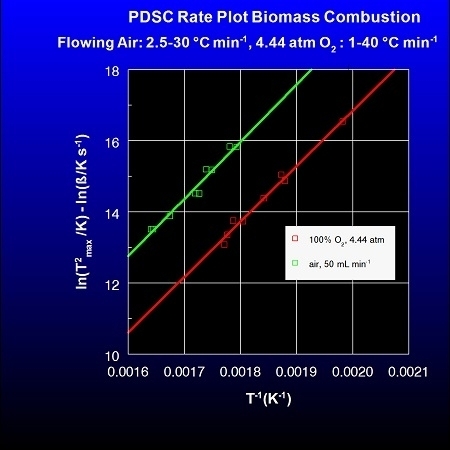 Thermal curves show the change in peak temperatures at two different heating rates for combustion of biomass under a constant pressure of 100% oxygen. 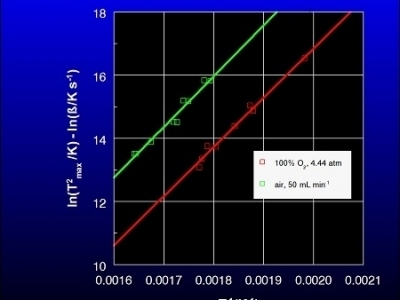 The graphic illustrates the rate plots obtained for biomass under air and 100% oxygen for variable heat rates. 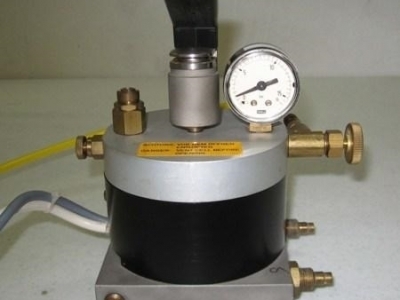 The slopes and intercepts of the regression lines and the oxygen pressure may be used to evaluate thermokinetic parameters and the reaction order for the biomass combustion.